For the first time in over thirty years, CWE hopper cars 73603 and 73582 are finally in regular revenue service on the railroad. These cars were built in the early 1980's and, as described in an earlier post, were the first two hopper cars ever lettered for the Chesapeake Wheeling & Erie. New numbers and cut levers were added and the interiors and exteriors were re-weathered. The photo below shows 73603 spotted at the recently completed Dry Creek Coal #2 tipple at Summit Springs. Upgrading these cars probably didn't take much less time than building and painting a couple of new hopper cars, but it was a fun project nevertheless. And it's kind of neat to have a couple of cars with a little bit of history on the layout. Now that all of the scenery and structures are in place at Dry Creek Coal Tipple #2 (more on that later), I've started re-staging the layout for the next operating session. Last night I brought one of the westbound freights back into the yard from staging and moved its power to the house. It just so happens that the two new F7's (more on that later, too) were there along with some of the other first generation power used for some of the locals. I thought it would be neat to get a shot of all of this first generation power at the Hollister Yard engine terminal. In this picture, you can see six units that are still in the original, as-delivered paint scheme (GP7 1542, SD9 1774, F7A 1564, F7A 1562, F7A 1565, and F7B 1573). All have been re-numbered into the current numbering system. Also shown in this picture is SD9 1763 which is still in an experimental paint scheme that was applied to a few units in the late 1960's. The entire short hood was painted yellow in an attempt to improve visibility but this was quickly abandoned as ineffective. The new F-units, along with the GP7, will take over duties on the Sand Fork Shifter while the F7 A&B units and the GP9 will move to Nelsonville. They'll be used on the Summit Springs Shifter that works Laurel Ridge Coal Company's prep plant at Summit Springs. The U33C and U28B that have worked the Summit Springs Shifter in the past will be assigned to other duties. 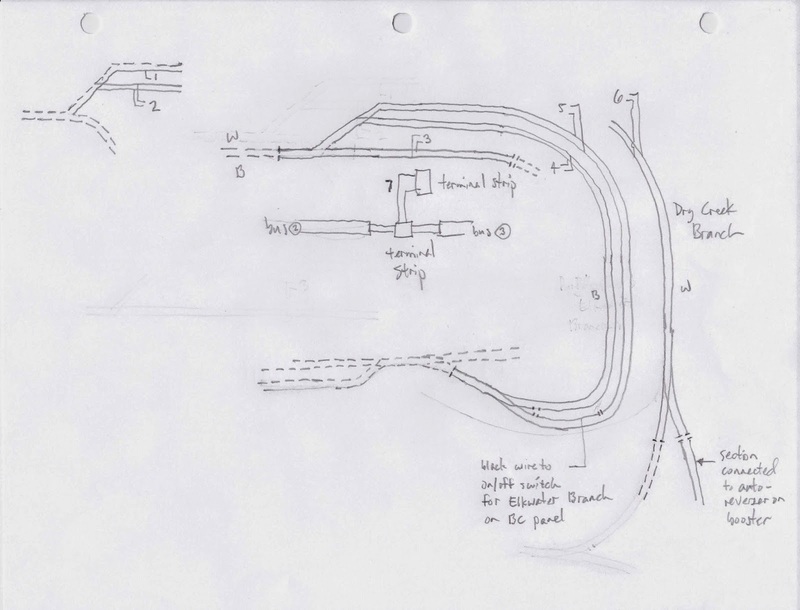 From the very beginning, I had always planned to have signals on the layout. The goal was to have a fully operational Centralized Traffic Control system complete with a dispatcher's panel based upon one of the Union Switch and Signal installations. The dispatcher would be able to control the entire railroad from a remote location, and trains would move according to signal indications. I studied whatever material I could find on signals and signal systems. I learned what the various aspects and indications meant and began to figure out how they might apply to certain locations on the layout. As progress continued on the layout, I added signals based upon what I thought would be a typical CTC installation. All of the signals have LED's and are wired for operation. Then in 2004, I purchased the user's manual and related materials for Bruce Chubb's Computer/Model Railroad Interface (C/MRI). As I began working through the manual and designing the system, it became apparent that this project would require much more time and effort than I originally anticipated. The programming required to make even a small layout like mine operational simply seemed overwhelming. The manual went up on the shelve to be considered another day. Fast forward almost ten years and I meet Gerry Albers. Gerry and his crew have created one of the most remarkable model railroads that I have ever seen. The Deepwater District of the Virginian Railway was featured in Great Model Railroads 2013 and the layout can be seen here: http://www.deepwaterdistrict.com/. The railroad features a fully operation CTC system that utilizes a program developed by Gerry. Information on this product and the related hardware is available here: http://www.signalsbyspreadsheet.com/. I attended several operating sessions on the Deepwater District and got to see the system in action. I then attended a clinic on signaling at a local hobby shop that was put on by Gerry and the hook was set. I had finally found a system that I could manage in terms of setting up the signal spreadsheets and installing the hardware. In order to install the signal system, the layout has to be wired in blocks. The CWE is divided into two separate power districts and has many built-in gaps due to the hand-laid track. I used all the recommended wiring techniques when building the layout so it appeared there wouldn't be a lot to do in order to get the layout ready for signalling. All I needed to do was verify where all of the existing blocks were located and I could begin to plan what additional blocks would be needed. That's when the Nightmare began. I disconnected the power district furthest from the power supply on one half of the layout to begin the testing. Surprisingly, the whole section still had power. So I disconnected the bus to the next session. Everything still had power. I eventually disconnected every district from the main bus- and the entire half of the layout still had power. There were three track feeder wires that ran from the terminal strip where the power came in from the booster connection that were the only possible source of power left. I disconnected the first two- and the entire half of the layout still had power. Finally, I disconnected the last one and the power was off. Half of the layout was receiving power from one track feeder wire. I'm sure it wouldn't have been enough to run trains, but power was there nevertheless. After a lot of head scratching, it occurred to me that the power from that one feeder to those two rails took a long trip all the way around the layout. Out along the solid connection from the Sand Fork Branch, down through Big Chimney, down the feeder wires at Big Chimney, back up the feeder wires at Summit Springs- you get the picture. It became apparent that I was going to have to document the electrical connections on the entire layout if I ever wanted to figure out how to set up the blocks for the signal system. So I spent the next two and half days under the layout tracing wires, drawing diagrams, cutting new gaps, and installing new feeders. Fortunately, I had just about finished the drawings for the signal system so I could use this as a reference when establishing where the new blocks should be. 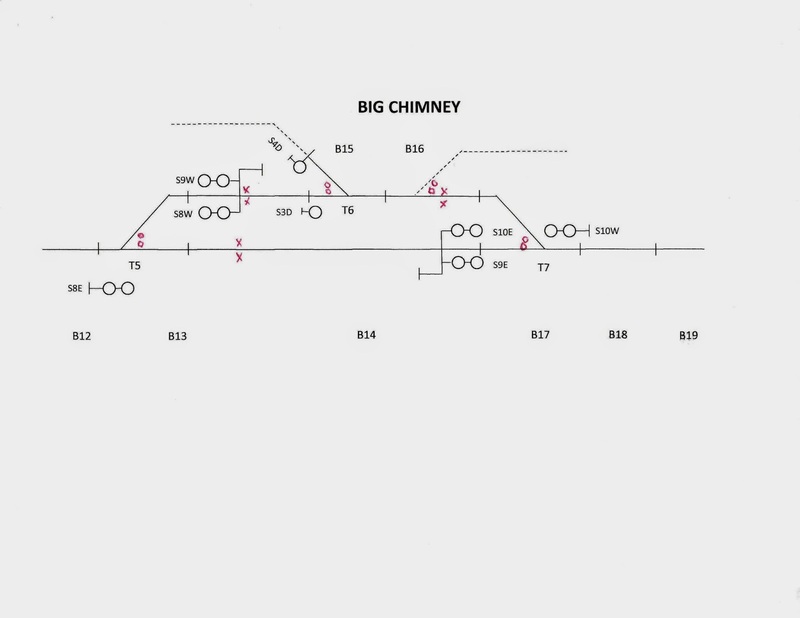 The drawing below shows the blocks and signals at Big Chimney (the red X's are feeders and the red O's are gaps) that were used for this process. 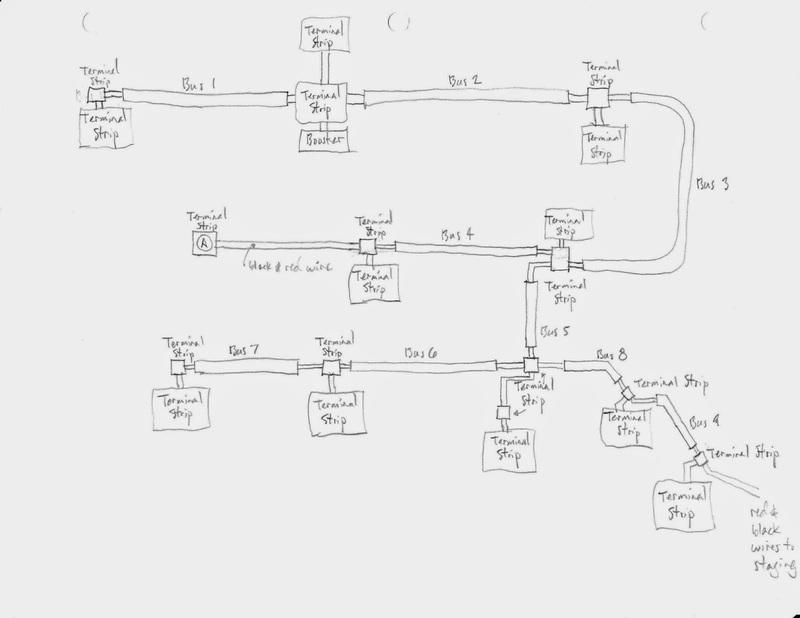 The benefit of all of this work is that I now have a notebook that contains wiring diagrams for the entire layout. The drawing below shows the master schematic for Zone 2. And there is a separate drawing for each zone which includes all of the feeder wires and their locations. The drawing below shows the zone that is controlled by the terminal strip between Bus 2 and Bus 3. Having these diagrams and the layout properly connected to separate power blocks is something I should have done many years ago. In fact, the lesson here is to do this as you build the layout, not after everything is operational and you've stored more stuff than you ever thought you owned under the layout. Believe me, your knees will thank you for this. Inspiration for projects can come out of nowhere sometimes, and that's what happened with the two hopper cars I'm working on right now. I had been planning to buy some Microscale trim film decals for another project and the idea came to me to use the trim film on these old cars. They were the first two cars ever painted and lettered for the Chesapeake, Wheeling & Erie and are old Athearn Blue Box 50-ton hopper cars. The photo below shows how these cars look today. They were painted and lettered before I had come up with the CWE herald and long before I put together a comprehensive numbering system for the railroad. I have no idea where the 3,000 series numbers came from- these cars would have been competed in the 1980- 1981 time frame. These cars also show some of my first attempts at weathering. I've long forgotten exactly what I did, but I'm fairly certain that most of it was done with an airbrush. I do remember that I weathered the interiors using techniques that Bill Darnaby outlined in an article in RMC in the late 1970's. That article convinced me that every car on the layout should be weathered to some degree and I still use some of his techniques today. The photo below shows the interior of the cars. Both of the cars are now in the shop. The cut levers have been replaced and will be painted along with the Kadee wheel sets. I'm not sure when the wheels sets were added, but they were never painted. I then plan to add some Microscale trim film over the reporting marks and update the cars with correct numbers. With some updated weathering on the trucks, couplers and car body, they'll be ready for regular revenue service.